Home > Shop By Brand > Ultima Car Care > Ultima Paint Guard Wash 128 oz. Ultima Paint Guard Wash will exceed your expectations with thick, luxurious suds that last through the entire wash. Paint Guard Wash is free-rinsing and never leaves a film. Your car emerges with a brilliant Ultima shine that's ready for the week ahead. This amazing car wash is so gentle it won't remove even the most delicate waxes, and it instantly restores the high gloss shine of Ultima Paint Guard Plus. Our exclusive formula creates volumes of suds, yet it rinses away in seconds. Plus, our special paint conditioners resist water spotting and streaking. Ultima Paint Guard Wash is hyper-concentrated. 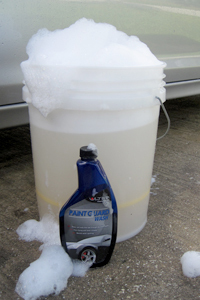 One 128 ounce gallon is enough product to produce 145 buckets of wash solution with suds that won't quit until the job is complete.